Take a Network Break! 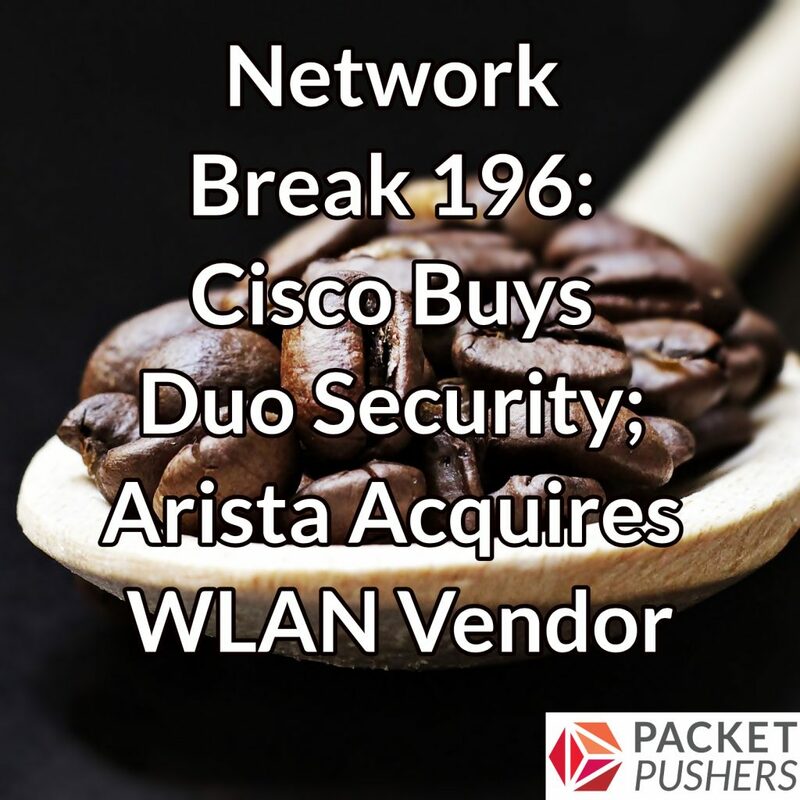 Cisco spends $2.35 billion to buy Duo Security, Arista Networks acquires WLAN vendor Mojo Networks, and Arista’s quarterly revenues rise. Infrastructure vendor Kontron acquires SDN software maker Inocybe, AWS’s IaaS market share slips ever so slightly, and Nokia and T-Mobile sign a $3.5 billion deal around 5G. Huawei eyes the number one ranking in mobile phone sales, Symantec announces layoffs, Google is reportedly building a censor-friendly mobile browser, and Juniper Networks sets a routing record. Get links to all these stories after our sponsor links, and please stay tuned for a Coffee Talk with ThousandEyes. ThousandEyes gives you performance visibility from every user to every app over any network, both internal and external, so you can smoothly migrate to the cloud, transform your WAN, troubleshoot faster and deliver exceptional user experiences. Sign up for a free account at thousandeyes.com/packetpushers and choose a free ThousandEyes t-shirt. The Packet Pushers talk with ThousandEyes about the ins and outs of monitoring Webex. Find out about Webex’s complex backend infrastructure, and how ThousandEyes can provide unique insights to help you get a handle on performance monitoring for this business-critical app. Are we seriously comparing China and other totalitarian governments with Republicans getting angry at Facebook for tagging right leaning stories as fake news or making them not appear at the top of news feeds? China kills its citizens, jails dissenters, disappears people….Republicans wine in Senate hearings and accept BS answers from nerdy billionaires. Side note! I Love You Guys!!! Even when Greg’s shows his funky left leaning globalization view points. You are honestly the best IT news/in sight source available!